This is an easy and fast pasta dish, that is almost completely made out of ingredients that you probably have already at home, perhaps not the fresh spinach leaves, but you can use frozen ones too, or leave it out altogether. I should collect more of these fast and out of the kitchen pantry recipes, as my last few supper cooking experiments weren't a real success, if not a total disaster. One was a Jamie Oliver grilled lamb minced meat recipe, which I managed to transform into lamb paste. I still grilled it hoping it would transform back into something tasty or at least edible. Even the cat didn't like it. The other disaster was just the wrong kind of pasta (angel hair I used) with homemade pesto. The pasta stuck together like glue, the pesto had absolutely no chance to get through. I am not sure what I was thinking when I threw these pastas into the boiling water, let's just call it one of the occasional kitchen blackouts. Cook pasta according to instructions. When ready, drain and reserve 1/2 cup of the pasta water. Heat the olive oil over medium heat in a pan. Fry onions for about 2 minutes, then add chili and anchovy fillets. Cook until anchovy has dissolved, about 3 minutes. Stir occasionally. Stir in beans and the tuna, cook for another few minutes. Add the spinach and cook until it is wilted. Take off the heat. 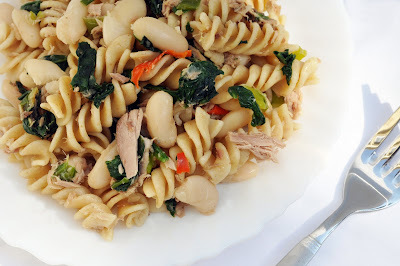 Stir the pasta into the tuna bean mixture, and add pasta water as needed, to make it a little saucier. Serve immediately.